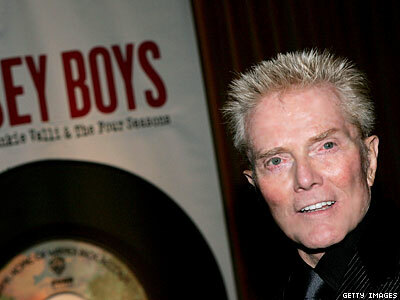 Bob Crewe was the gay mega-talent composer and producer behind the Four Seasons. We learned today that he died, and so we re-present this article highlighting much of his work. Bob Crewe is a hit maker. The songs he wrote and produced for the Four Seasons made them one of the top musical groups of all time. But his songs and his production work also helped brighten the careers of the Rays, Diane Renay, Mitch Ryder and the Detroit Wheels, Freddy Cannon, Lesley Gore, Oliver, Michael Jackson, Bobby Darin, Roberta Flack, Peabo Bryson, and Patti LaBelle. He was definitely a Jersey Boy, born in Newark in 1931 with a natural talent for music even though he had no formal training. Instead he attended Parsons School of Design in New York. Besides being one of the biggest hit makers of the 20th century, he is also a successful visual artist and sculptor who could have made a plush living on his art alone. Charming, too smart for his own good, and possessing more energy than any other human on the planet, he harnessed his multiple talents and shaped the music of our lives. Jersey Boys opens this weekend, and you will see a character representing Bob in the film. You'll enjoy the Four Season hits on the soundtrack, but in the meantime, we have assembled some clips of his most popular work composing and producing for other stars on the following pages.